I think you'll be very surprised just how much this grilled chicken fajita recipe tastes like the smoky mesquite flavored fajitas you'd normally order in popular Tex Mex restaurants. The secret? It's a couple of easy preparation tricks we've tested on this fajita recipe until perfect. 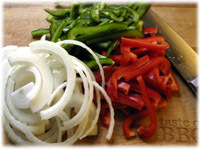 The fajita marinade recipe is actually used on the red and green peppers and onions, not on the meat. 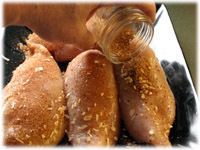 For the chicken, we only use the Cajun seasoning recipe here (which is also repeated below). What this does is keep the spicy flavor on the chicken from the grill to the table for that full restaurant-style fajita flavor. 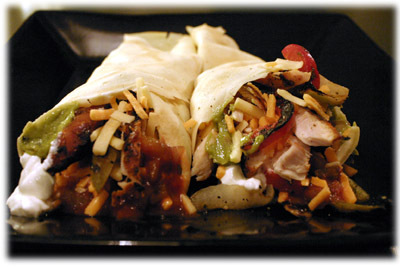 If you can let the vegetables sit overnight in the fajita marinade recipe and let the chicken sit overnight in the Cajun rub then you will have the ultimate mesquite fajita flavors possible. 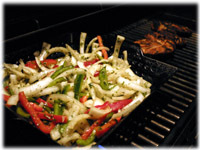 Use a perforated grill basket for the peppers and onions and cook them right along side the meat. After the chicken's cooked slice it thinly and serve with the peppers and onions along with salsa, sour cream, shredded cheese and guacamole. 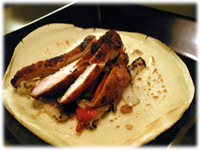 For an interesting twist to this chicken fajita recipe you may want to try wrapping these in light fluffy crepes like the picture above instead of the typical flour tortillas. Note: for best results, marinate the veggies and the cajun rubbed chicken overnight. 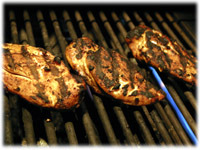 Rub 1 tablespoon of the Cajun seasoning rub on each boneless skinless chicken breast. 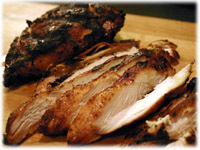 Cover and refrigerate the chicken at least 4 hours but up to overnight for a stronger flavor. 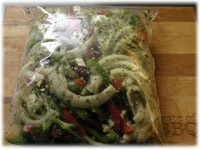 Slice the red and green pepper and onion into strips and put them in a resealable plastic bag. 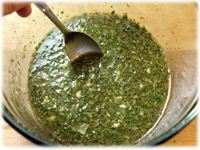 Chop the cilantro and garlic and place in a medium glass mixing bowl. Add the remainder of the fajita marinade ingredients to the bowl and whisk well to combine. Pour the marinade into the bag of peppers and onions, reseal and place in the refrigerator for at least 4 hours or up to overnight for a stronger flavor. Preheat the BBQ to 600F - 650F. Apply a generous coating of cooking oil spray to a perforated grill wok (for the vegetables) and place on the grates to warm up with the BBQ. 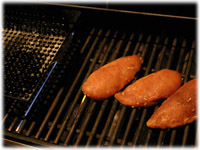 When the grill reaches cooking temperature, place the chicken on the grates and close the lid. After 5 minutes lift the lid and rotate the chicken 1/4 turn and close the lid. After another 5 minutes, flip the chicken over. Now place the vegetables in the perforated grill wok and stir occasionally. After 5 minutes, rotate the chicken 1/4 turn. After another 5 minutes, check the meat with an instant read thermometer, they should be at least 165F. Remove the chicken, cover and let rest 5 minutes. Remove the vegetables and cover. Slice the breasts in half length-wise and then slice into thin strips. Place some of the peppers, onions and sliced fajita chicken in warm flour tortilla's or for a complete change try soft fluffy crepes instead. 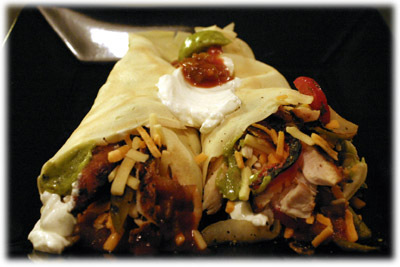 Add salsa, sour cream, guacamole and shredded cheese - roll-up and enjoy your new chicken fajita recipe!